Dell Inspiron 530s 531s 537s 540s 545s 546s 560s 570s 580s 620s. 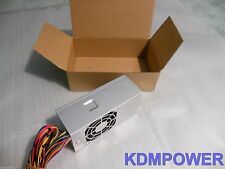 - Mother Board Connector - Internal 40mm ball-bearing fan. - Floppy Connector - 4 Pin Molex - SATA Connectors - 4 pin x 1. - CPU Connector. Inspiron 518, 519, 530, 531, 537, 540, 541, 545, 546, 560, 570, 580, 620, 660, 3847, 3000 "Deskop" Mini Towers. Dell Vostro: 200, 201, 220, 230, 260, 270, 400 Mini Towers. 350 Watt Max Output. It's fun and easy and everyone wins. MPN: 076VCK, CN-076VCK, WX9P8, CYY97, 7GC81, 6MVJH, YJ1JT, 3MV8H, 3WFNF, 5FFR5, 76VCK, HY6D2, MPX3V, PWJ55, T498G, W207D, W208D, W209D, W210D, X3KJ8, XFWXR, FY9H3, K2H58, 77GHN, PDF9N, DY72N, 375CN, CVJ4W, T497G, G4V10, 43F30, 4M8GF. From a 546s, tested. dell number P164N. see pictures. Dell Compatible Part Numbers: WX9P8, CYY97, 7GC81, 6MVJH, YJ1JT, 3MV8H, 3WFNF, 5FFR5, 76VCK, HY6D2, MPX3V, PWJ55, T498G, W207D, W208D, W209D, W210D, X3KJ8, XFWXR, FY9H3, K2H58, 77GHN, PDF9N, DY72N, 375CN, CVJ4W, T497G, G4V10, 43F30, 4M8GF. Dell Inspiron 537s 540s 545s 546s 560s 570s 580s 620s Slimline SFF. It includes these output connectors: 24(20 4)pin x 1, P4-12V 4pin x 1,SATA II 15pin x 3, Molex 4pin x 3, and FDD 4pin x 1. 0° C ~ 50° C on Output Load ;. Plus it frees up more room inside the case for better air circulation and it is easy to install because it is slightly smaller in size. All screw holes will line up nicely with the Dell case and the unit will be securely installed. Mother Board Connector 80 Plus Certified Current 16A. - 3.4" x 2.5" x 7"( W x H x D ). 12 Volt Rails - Internal 40mm ball-bearing fan. - Floppy Connector -4 Pin Molex. Dell Inspiron 518, 519, 530, 531, 537, 540, 541, 545, 546, 560, 570, 580. Computer & Server Parts. Printer Parts & Supplies. Dell Vostro 200, 201, 220, 400. Laptop DC Power Jacks. 1 x 24 Pin ATX Main Power Connector. Compatible models shown above are for reference purpose only. not all compatible models are listed. Output: 5V 13A, -5V 0.5A, 12V1 9A, 12V2 9A, -12V 0.8A, 3.3V 13A, 5V-SB 2.5A. MTBF: 100,000 Hours on Maximum Load at 25°C. Compatible models shown above are for reference purpose only. not all compatible models are listed. MTBF: 100,000 Hours on Maximum Load at 25°C. Type: TFX SFF. 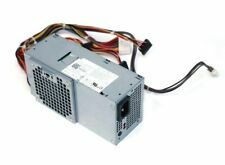 Product description：This is a Great Quality 250W 3WN11 PH3C2 H240AS-00 DPS-240WB Power Supply Unit PSU Made by the world famous best power supply manufacturer,like: DELTA ELECTRONICS, LITE-ON TECHNOLOGY, ACBEL POLYTECH INC Compatible Part Numbers: CYY97, 7GC81, HY6D2, WX9P8, 6MVJH, YJ1JT, 3MV8H, 3WFNF, 5FFR5, 76VCK, MPX3V, PWJ55, T498G, W208D, W209D, W210D, X3KJ8, XFWXR Compatible Model Numbers: L250NS-00, D250AD-00, PS-5251-08D, PS-5251-5, H250AD-00, D250A1005L, D250ED-00, DPS-250AB-67 A, F250ED-00, D-0250ADU00-101, D250ND-00, REF, DPS-250AB-73A, AC250NS-00, PCA038, TFX0250D5WB, D250AD-01 D250ED-01, DPS-250AB-68 A, F250AD-00, D-0250ADU00-201, PC7068, HP-D2506R0, PS-5251-5, DPS-250AB-36, TFX0250D5WB, H250ED-00, D250E006L, PS-5251-06 Com. New MonCaso 300P Black. We will try our best to resolve the issue. or for any reason you are not satisfied with the item. 480W (Max. Dell Inspiron. - Internal 40mm ball-bearing fan. - 6 Pin PCI-E x 1. - Floppy Connector - 4 Pin Molex - SATA Connectors - 4 pin x 1. ). Dell P/N: 0 6R89K /6R89K. Inspiron 518 519 537 545 546 540 560 570 580 ( mini-tower). Max Output Power. No product liability is included under any circumstances. PATA HD/CD-ROM Drive connectors. Floppy Drive Connectors. Maximum Power Output: 750W. Now supports upgrade to faster PCIe graphic card. Here's our 750W LED Version. Dell Inspiron 530 / 531 / 537 / 545 / 546 / 560 / 570/ 580/ 620/ 660Mini Tower PC. Q: Dell Inspiron has more than one form factor. New item arrived promptly and worked for my PC. Re-settable power shut down. 100% Hi-pot, ATE, and burn-in tested. Round fan guard provides better air flow. Long life ball bearing fan. High efficiency with switching technology. Dell Inspiron 570 computer, and a HP wireless printer comes with speakers (not shown) all are in very good condition..
Max Power: 300 Watt. 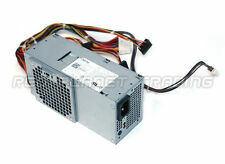 Microtower PC DC5750 DC5700 DX2400 DX2450 DC5750 DC5700 DX7500. Fits model(s) but Not Limited To 1X 4-Pin(2x2) Connector. 447402-001 447585-001 FY9H3 375CN 6MVJH 76VCK 7GC81 CYY97 G4V10 HY6D2 NCYVN XSKJ8 3WFNF. Optiplex 390 790 990 3010. Form Factor: Slim/Small Desktop (Not Small Form Factor). (No Floppy Drive Connector). Inspiron 530s 531s 537s 540s 545s 546s 560s 570s 580s 620s 620s. Studio 540s 537s 560s. 24-Pin Connector. Optiplex 390 790 990. Vostro 200s 220s 230s 260s 400s. W206D, 7GC81, 6MVJH, FY9H3, CYY97, XFWXR, X3KJ8, YX302, W206D, 76VCK, H5VW9, 57K42, G4V10, 77GHN, 3MV8H, HY6D2, PWJ55, MPX3V, T498G, W208D, W209D, W210D, WX9P8, 6MVJH, YJ1JT, 3WFNF, 5FFR5. 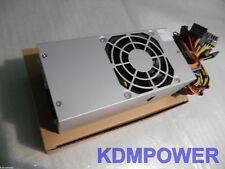 Output Power: 350 W. condition: New. POWER SUPPLIES. ‣ Power Supplies. Condition: New. MTBF: >100,000 Hours. ‣ LCD Mounts. Input Frequency Range: 50/60 Hz. Compatibility: Dell Inspiron 570s, Dell Inspiron 580s. POWER SUPPLIES. ‣ Power Supplies. Cooling: 80mm Cooling Fan w/ Double Ball Bearing. Connectors: 20 4 Pin Motherboard, 4-Pin CPU, 3x Molex, Floppy, 3x SATA. Compatibility: Dell Inspiron 570S 580S. POWER SUPPLIES. ‣ Power Supplies. Connectors: 20 4 Pin Motherboard, 4-Pin CPU, 2x Molex, Floppy, 2x SATA. Compatibility: Dell Inspiron 570S 580S. 400W power! POWER SUPPLIES. ‣ Power Supplies. Weight: 3lb. Compatibility: Dell Inspiron 570S 580S. 320W power! POWER SUPPLIES. ‣ Power Supplies. Weight: 3lb.